The Luminous Mysteries Rosary CD contains…. 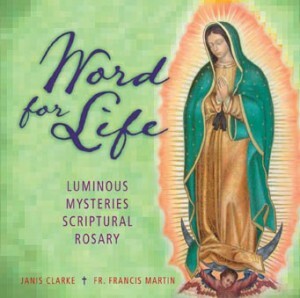 the prayers of the Rosary which are themselves scriptural, with background music comprising improvisations on traditional hymns and compositions by Janis Clarke. profound scripture meditations before each decade, scripture passages before each Hail Mary and inspired scriptural chants composed by Janis (after each decade) that correspond to the 5 luminous mysteries. a classical rendition of Salve Regina and the beautiful and reverent song, I Bow Down, composed by Janis Clarke to conclude the rosary. extended scripture meditations by renowned scripture scholar Fr. Francis Martin that open up the Word of God for deep, life-transforming intimacy with Jesus. an invitation to spend time with Jesus and get to know him more intimately in the major events of his public ministry, beginning with his baptism and culminating in his institution of the Eucharist.